The kitchen is the center of a home. It's where we gather to share stories over a home cooked meal, or gab near the gravy. What goes into making a kitchen a place where you want to gather though? Which features, layouts, and touches make a kitchen more than just a room where you go to cook, but a place that is identifiable with your family as the gathering place? Here are some different ways to make your kitchen a room that is loved by everyone in your family. 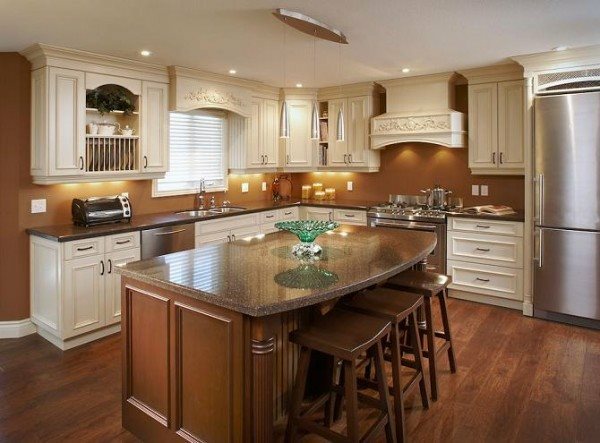 A kitchen island is a truly remarkable feature in any family kitchen. It allows more counter space for larger meals, it also has potential to expand the storage space in your kitchen, and it can also be a space for serving from. If the flow of your kitchen allows, bar stools can also be added here or there for extra seating space. If you live in a home with a smaller kitchen with limited cabinetry, the island is an especially handy add on, and can be customized fairly easily to fir your storage needs. If you are a family that entertains, a kitchen that opens up and expands to the outdoors is a wonderful feature for your home. A set of French doors or a sliding door offers easy access to some other family cooking favorites, such as the grill or smoker. This could also allow for extra seating only footsteps away in the form of a patio table. Keeping the food in your kitchen or out on the deck allows for easier cleanup, especially if there are spills with the little ones during large family gatherings. When the kitchen table is included in the kitchen, it makes serving and eating very easy. Imagine what was once a breakfast bar expanded into a countertop. This is normally part of a center island that can seat up to six people. This kitchen feature is excellent for a busy family that is always on the go, streamlining serving and easy cleanup into a single room. You can also use this concept in the breakfast nook, with built-in seating and it can serve as an opportunity for your decorative flair with cushions and pillows. Fewer visual surrounding can sometimes help our thinking, this is where the hide-away concept comes into play. Everything from microwaves and toaster ovens, to mixers and coffee stations can be hidden away in their own little cubbies. Once the appliance has been used, the custom made door can be shut to help keep it hidden away again. Never again to clutter up your countertops or thought processes. This concept could also be used to store your cleaning supplies and help to expand the pantry. Often times, custom built-ins on wheels can make s huge difference for expanding your storage. They can be camouflaged in, used when needed, and then hidden away again. When you have everything is its own specific area, organization happens naturally. Think eating station, cooking station, dishwashing station, etc. Your kitchen has everything tailored to be in the exact spot where it is needed, and to be accessed easily. As an example, everyday dishes should be kept directly above the dishwasher, next to the sink, and within reach of your towels for drying to make up your dishwashing zone. It can be a challenge to keep your kitchen clean and functional, yet still inviting. But with these tips for customization, you are just steps away from having your perfect family kitchen!